"...Looking for information and anyone who knew Frank Avitabile, who served in the 13th Infantry Regiment Service Company...."
Frank Avitabile, who served in the 13th Infantry Regiment Service Company. 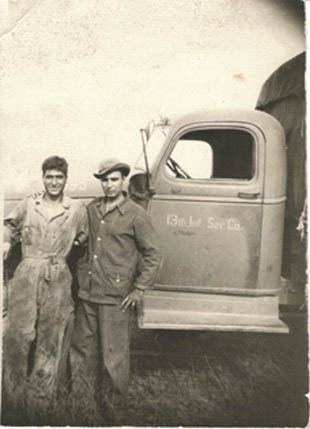 I have a picture of my uncle Frank Avitabile standing with a friend next to a truck that is identified as: 13th Infanty Service Co.
Maybe somebody can help me. I have been looking for information about my Uncle Frank (Avitabile). He joined the army around December 8, 1941. I know that he was in North or South Carolina soon after he enlisted. He was a mechanic and also was involved with motorcycles in the service. He was killed in early April 1945. His records were lost at the Archives fire. His I.D. Number is: ID: 32063208. He was from Bergen County, NJ. I was hoping I could find someone with information. I have his Bronze Star Medal, but I do not know where he received it. Please assist me if you can. The above photo and information with regards to Frank Avitabile, was forwarded to us by his nephew, Salvitore Avitabile. The material is re-printed here on World War II Stories -- In Their Own Words with the kind permission of Mr. Avitabile. Our sincerest THANKS to Mr. Avitabile for allowing us to share these excellent memories. Original Story submitted on 31 May 2005. Story added to website on 1 June 2005.